This was the first Konami game I ever saw or played, although it’s not their first game. People were impressed with Pacman but this was the first game that showed me that video games were going to be the future. This is the first game I remember having upgrades and also the concept of getting a “perfect”. This was the first game I played that had bonus stages too. You take the role of a starship fighter pilot trying to fight your way to earth. The entire solar system has been taken over by a legion of enemy fighters and space stations. Your lone fighter will get swarm attacked by a pack of enemy fighters that will come at you in a specific attack pattern depending on what squadron you’re fighting and what planet you’re traveling to next. Your ship rotates around the center of the screen as you fight your enemies and keep flying forward. You start at Neptune and travel in order of the planets until you make it to Earth. Not only are fighters coming at you at a fast rate but you have to deal with the projectiles they sometimes fire at you, passing asteroids, energy barriers that can rip you apart, and space stations that spawn at the end of a stage. Everything in this game kills you with one shot. If you get touched by an enemy ship or any other object, you instantly die. At the end of the level, when there are a swarm of enemy fighters circling in the background, 2-3 enemy space stations will appear, one which, if you haven’t picked up the upgrade yet, will make two beams circle around the screen and land on your ship once you kill it, giving your weapon twice the width in spread. If you kill a certain grouping of enemies in a specifically quick manner and leave no survivors the game also awards you with bonus points. This matters in this game, actually, because you get bonus lives based on your score. The game loops when you beat it until you run out of lives. This game has always made me think of the movie The Last Starfighter. In my mind, as a child, I imagined that it took place in that universe and the main character was fighting his way back home. 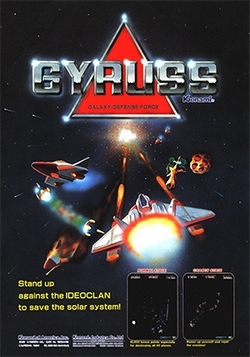 Gyruss is available originally for the Atari computers as well as 2600 and 5200 consoles, the ColecoVision console, the Commodore 64, and for the NES. The game got rereleased for Playstation, Gameboy Advanced, and Xbox Live Arcade. Gyruss is a ton of fun and my favorite early shooter game. It’s a lot of fun to hear the swarm sound of a group of fighters jumping out at you in a really fast pattern and you blasting away as much as possible trying to kill them all and gain the bonus points while keeping them from ramming you or shooting you as well. Fun Factor gets a score of 10 out of 10. There is no way to change the difficulty but the game is challenging enough for most gamers as it is. The longer you play it, the harder it gets. The enemies will attack you more often in each passing stage. 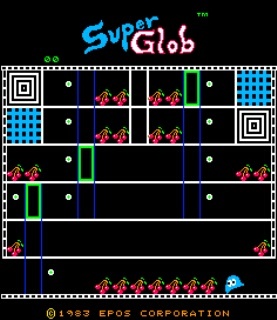 Overall, the game is tough near the later stages but it’s still playable. Since you can’t change the difficulty that hurts it but it’s hard enough for most players. I give Difficulty Versatility a score of 7 out of 10. Most people will just play this on M.A.M.E. these days so basically the ROM is free. Technically, you’re not supposed to play ROMs unless you own the game already. The link to download the c64 emulated version is the following from c64.com. I couldn’t easily find the Playstation and GBA versions for sale as they might be out of print. Since most people will play the emulated versions, I’d give Value a score of 10 out of 10. The sound effects are super retro and they’re brilliant. My favorite sound effects are the blast of the main gun, the teleportation sound from when you warp to the next stage, the gun UPGRADE sound (oh god yes), and the explosion when one bites the dust. The rest of the sounds are great and sound like a perfect blend of retro arcade. Sound gets a score of 10 out of 10. To me classical music in games, especially ones with a ton of action is pretty epic. Music gets a score of 10 out of 10. For an early 80s game, this game looks simply amazing. Most of the enemies for the main stages look the same but the enemies for the bonus stages look unique depending on which bonus stage you are doing. The game looks like a total evolution over Space Invaders. 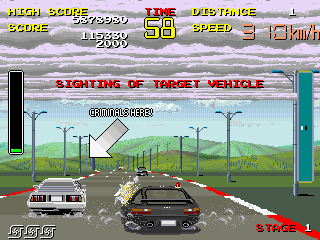 Graphics get a score of 10 out of 10, considering this is a 1983 game. Since the 80s I’ve never seen this game crash or get stuck once, not even after playing it for ours on my old c64. Stability/Reliability are perfect and get a 10 out of 10. On all versions, the controls are really simple. Left rotates you in that direction and right rotates you in that direction. Fire just fires for all versions. Nothing fancy or confusing there. For the arcade version, the ship will rotate in the direction of where you have the joystick pointed towards. If you keep it towards the top and you keep pointing up, the ship will just stay there once it’s topped out there. For the c64 version, it’s a little different. Left moves you counter-clockwise, and right moves you clockwise, no matter what. Controls can’t get simpler than that. Controls get a score of 10 out of 10. Perfect performance, even when the game just came out. Performance gets a score of 10 out of 10. 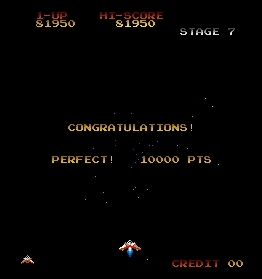 Gyruss is a classic arcade game that should be played by everybody, especially retro arcade gaming junkies! Leave your comments below or on our social sites!